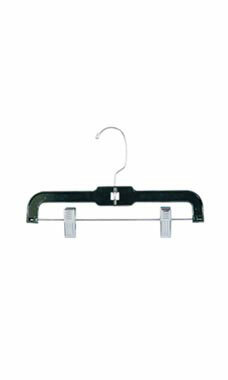 Skirt and pants hangers are among the most versatile in our selection of hangers. These 11" black plastic skirt and pant hangers are perfect for junior and child's sizes clothing. Designed with added elastomers for maximum flexibility, these hangers feature securely anchored bright plated swivel hooks to maximize space on clothing racks. Hang bars and super strong padded clips offer a variety of ways to hang clothing, which provides diversity in presentation. Sold in cases of 100 at wholesale prices!